Proof before letters is the term for an impression of a print withdrawn before the title is added to the image prior to publication. This is a proof before letters copy of Langley & Belche's 1812, with illustrated views of prominent London buildings (including the newly opened docks) along the top and bottom of the plate. The plan is divided into lettered squares for reference. 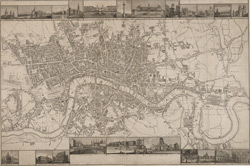 It was originally accompanied by Langley & Belch's street directory or 'Companion to their new map of London'.